The latest volume in this beautifully produced and affordable series introduces readers to the major developments in the history of modern art--from Realism to the New Leipzig School. The story of modern art begins with a revolution--when the realists started rejecting romanticism in favor of depicting life as it really was. Since that movement began in the mid- 19th century, painters have been rebelling, rethinking, deconstructing, and challenging notions of what art is. Filled with stunning reproductions of some of the world's greatest masterpieces, this reference book offers a chronological journey through artistic revolutions. Each movement is presented in a series of informative presentations--a concise definition and description; full-page and smaller detailed color illustrations; and in-depth profiles of the artists crucial to the style's development. 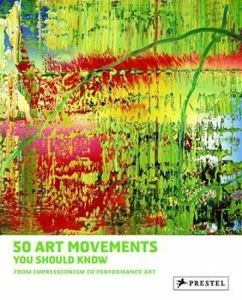 Covering a wide range of movements both familiar and obscure, this accessible and informative volume is a perfect introduction for readers interested in art's constantly evolving story.